A recent Cabinet Office presentation of the GCloud to SOCITM London had some good news, and some things to do better. Good: There are lots more suppliers and the offerings are much simpler, and less costly to purchase. They are preparing the terms and conditions for the next round and consulting on changes that make sense. Suppliers in the audience pressed there need for longer contracts; even two years is not enough for the more complex requirements of information sharing in local government. Must do better: The presentation did not mention standards. The messages from LeGSB are not getting through. Virtually the whole audience thought there was room for suppliers to say which interoperability standards they would use. It is the only way to develop multi-agency services from bottom-up. Will we see the resurgence of the e-GIF and LGIP (Local Government Integration Practice)? Will we advance as far as India? Will Liam Maxwell’s targets for Open Standards be met? For many years EURIM has been influential in information technology policy in Parliament. It is obvious that the acronym, recently exposed as European Information Market, has passed its sell-by date. The secondary name became the “Information Society Alliance”, and that has now been replaced by the “Digital Policy Alliance”. Perhaps this is destined to become the new primary name. But beware, this could become the DPA. If so, it risks becoming confused with the Data Protection Act. They have launched a new website at http://dpalliance.org.uk/, with a strapline ‘informing policy for a competitive, inclusive, networked society“. Great aspirations, but avoid using the site on small mobile devices such as smartphones. The layout is too wide and complex, needing enlargement and sideways scrolling. The font sizes are small, cramming more on a page, causing problems on small laptops, too. The website is thus less inclusive than it could be. Any visually impaired users of the site will have problems. SOCITM, for a soon to be launched Website, decided to commision a simple 2 column design with the main text, on the left. It will automatically resize to the device screen size. This avoids the cost of a special redesign for mobile devices. Old school graphics designers don’t like this style – they place artistic impression ahead of usability and accessibility. Digital Policy, to be inclusive, must respect the needs of the visually impaired. To be fair, the IER Progress Presentation July 2012 did not use the word ‘compulsory’ for voter registration, but the meaning is clear. This is the result of the consultation process for the Electoral Reform Act (2012). The objective is to reduce risk of losing voters with more levers to drive registration and to build a more accurate register during the transition to the new scheme. Believers in our democratic system should be pleased – the current method is too incredible for foreigners to believe. We have also been given an overview of the IER Digital Service. This separates the web application used by the citizen with two centrally controlled and hosted systems. One is run by DWP and the other by the System Owner (Cabinet Office or DCLG?). Local Authorities (LA1 to LA400+) are expected buy and operate a system from one of four Electoral Management Systems (EMSA to EMSB). 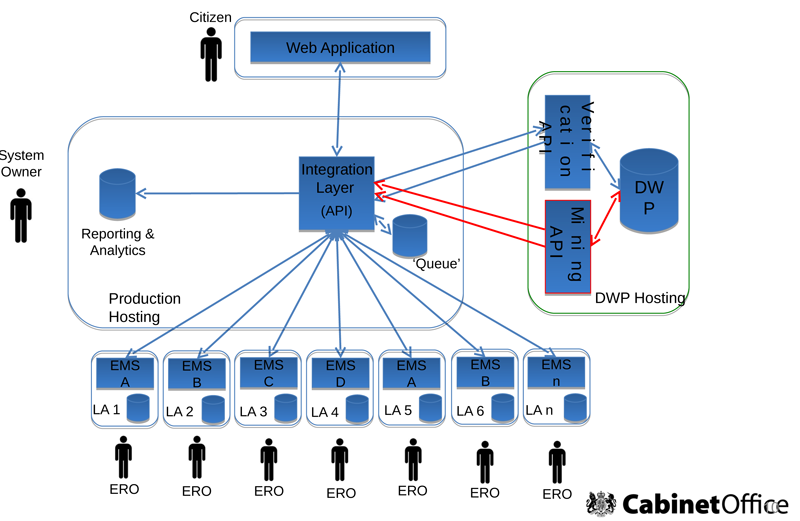 The lines and boxes are easy to draw, but what are the implications to the local Electoral Registration Officers (EROs) and their ICT service departments? If citizens have to register on the national site, what local credentials do they have to provide? Does the DWP verification imply that somewhere they hold a register of all voters? If so, how does this map to the national policy not to hold national identification scheme? How much trust can the LA put on the identity of the voter, knowing that DWP data is 34% inaccurate? SOCITM should be high up the list of organisations to help in the impact assessment to local authority ICT systems. The current register may have additional local uses that have not yet hit the radar. – Virtually no central government departments have been asked. One would have expected HMRC and DWP should have some evidence – not just the DVLA. – No representative organisation from local government, such as Solace, LGA or Socitm. But there are a few individual local authorities such as Norfolk County Council. When these organisations collectively record personal data for every single citizen, surely they should have been asked. It is not an issue of politeness – but politics and policy. Information governance must include the key stakeholders – not just an apparently random selection. Dedicated followers of Socitm will know that the five year forward strategy is called “Planting the Flag”. It was published in May 2011 and yesterday was a timely review in a joint meeting with the local CIO Council. Progress is being made on “Planning the Routes” and “Driving the Routes”. The diversity of size and responsibility of Socitm members is such that one size cannot possibly fit all. The documents can only be considered as frameworks for action. As one speaker pointed out, best practice is backward looking, and less important if we are trying to encourage innovation and transforming business processes. One group, consisting mainly of CIOs, pointed their problem is communicating the messages to their chief officers and members. The the names of the stages are a metaphor of planning a trek into the high peaks of the Alps. That’s fine for invigorating a live audience – but it gets in the way of releasing budget for doing things differently. Most concerning was that the strategy does address the practical problems of delivering IT enabled services to citizens – it is not driven by the outcomes that are at the forefront of delivery agencies’ agenda. Everybody in the room bought into those principles and capabilities – but they are essentially inward looking to the ICT profession. They are not the issues that attract support from democratic or service leadership. When CIOs go back to their patches, they are faced with translating the strategy and briefing notes into something digestible for supporting business cases for change. The advice has to fit into the local political agenda. Nobody is saying that is a simple job for Socitm – but there is a need for a simpler message for a broader range of stakeholders. Neither should it be just for local authorities; it has to go out to health, police, emergency services, transport and innumerable voluntary sector agencies. UKRA: Where are Citizens and Local Authorities? Provide a framework to enable activity, process and complex systems to be broken down into small modular components, with known attributes, functionality, interfaces and dependencies. Record those components in a way that business process owners, ICT service designers and solution providers can readily identify common areas of functionality. Provide a framework against which common process and procedure can be developed to enable the effective reuse of solutions and services across government. It is not remotely citizen focussed – it is inward looking into arcane administrative activity. Why? No sign of the Department for Communities and Local Government (DCLG) or LAs. Why are LAs always latecomers into such strategic activity? Let’s hope that there will be some input from Socitm in due course, they are used to managing wide consultations in public sector ICT. He did ask “WHAT WILL SUCCESS LOOK LIKE? Our goal should be to deliver to the online population frontline public services with minimal, possibly zero, administrative cost, freeing up cash for more effective, intermediary-based, service delivery for those not online, and also as savings. This is already happening in some areas of local government and driving taxes down. It is happening in other countries, making service delivery better. It is time the biggest component of the British economy, its bloated state, started to learn these lessons. d. Open Markets – competition creates efficient market-based solutions. 2) Localism – the centre may set the standards, but local deployment is best. a. It’s our data, government can have access but not control over personal data. b. Government should be accountable for data protection and proper use. 4) Outcomes matter more than targets. Let’s look to see how successfully the principles have been incorporated into the Government ICT Strategy. 1. Open data, open standards and open source are clearly stated objectives. And open markets are part of the procurement objective. 2. Localism does not get a mention, according to word search. This is a gaping hole, but perhaps Liam will explain this when he speaks at the SOCITM conference in November. 3. Alarmingly, neither privacy nor data protection are words within the strategy. The objective for “Risk Management Regime” has implied elements for both, but the metrics concentrate system security – not anything based on citizen data protection. 4. Outcomes are potentially the most important gap in the strategy. There’s too much concentration on internal, central government processes. The four objectives for “using ICT to enable and deliver change” are not really focussed on citizen outcomes. 5. Governance of programmes is an implicit role for the “Public Expenditure (Efficiency and Reform) Cabinet sub-committee (PEX(ER))“. There are twelve senior people named, with representatives from MOD, MOJ, HMRC, HO, DoH, DWP and Cabinet Office. That should be enough people. However, Quarkside thinks that UK plc should also have representation from departments with responsibility for improving the ICT skill base of the country. Shouldn’t DfE and BIS have something useful to contribute? And if localism is really important, why doesn’t DCLG have a place on the high table? Quarkside gives “Better for Less” 40 marks out of a possible 100 for influencing the agenda. In the old days, this was a ‘Pass’ at A level. So not too bad. However, it would not have secured you a place in one of the top universities. Bill McCluggage, deputy Government CIO, confirmed that the GCloud is not dead at the Cloud Conference on June 21st. But it does still need definition. The problem is converting policy into practice. The proposed governance regime, where there is some measure of mandation, is primarily concentrated on six large ministries: Home Office, DWP, HMRC, MoJ, DoH and MoD. They will be expected to consolidate data centres and purchase from an App Store. The omission of Education, BIS, FCO and DCLG raised a few eyebrows in the audience. When questioned about the absence of 450 local authorities in the governance regime, he said the job was big enough with six agencies without contemplating adding the diversity of local government. He did, however, refer to “Planting the Flag” without directly refering to SOCITM. So he does endorse the strategy (referring only to Joss), but not as part of his public presentation.